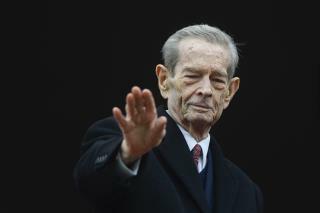 (Newser) – Former Romanian King Michael I, who was forced to abdicate by the communists in the aftermath of World War II, died on Tuesday. He was 96. Michael, who played a pivotal role in Romania's switch to the Allied cause following a coup in 1944, spent decades in exile working as a chicken farmer and aircraft pilot. He finally got his citizenship back in 1997, eight years after the collapse of communism. Michael's death leaves only two people alive who headed their nations during the war—former King Simeon II of Bulgaria, and the Dalai Lama of Tibet, both of whom were children at the time. In a statement, the Romanian royal house said Michael died in his residence in Aubonne, Switzerland. Michael had been suffering from leukemia and another type of cancer and last year withdrew from public life, handing over his responsibilities to his oldest daughter. Michael, a great-great grandson to Britain's Queen Victoria, acceded to the throne in 1927 when he was six years old after his father Carol II eloped with his mistress and abdicated. After three years Carol returned to the throne and stayed there until abdicating again in 1940. Michael then reigned for seven years, a time most notably marked by the events of Aug. 23, 1944, when the New York Times reports the then-22-year-old "bravely summoned" the country's pro-Nazi dictator, Ion Antonescu, to the palace and arrested him. Some historians say the move may have trimmed months off the war and spared tens of thousands of lives. After the war, Michael was little more than a figurehead as the Soviets installed a communist-led government and was in 1947 told to sign a pre-typed abdication or else 1,000 soldiers would be executed. The AP has much more on his life. And to think that today's Republicans are idolizing the Nazis. Sickening.